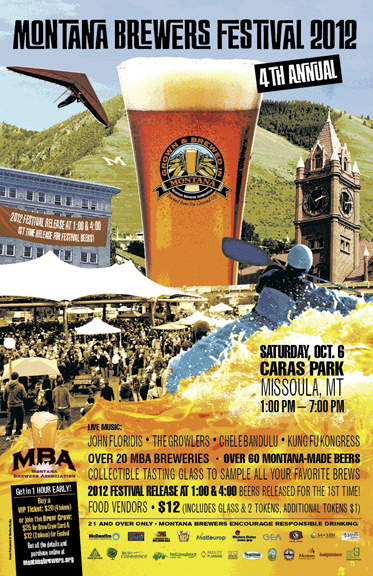 For the first time, Missoula will host the annual Montana Brewers Association (MBA) Brewers Festival on Saturday October 6, 2012 at Caras Park. A VIP ticket will get you in the door an hour early (noon); otherwise, the event starts at 1:00 PM. $12 gets you one general admission ticket, a glass and two tokens (additional tokens are $1). New this year is a two-day beer conference following the festival (Sunday and Monday). Held at the Downtown Holiday Inn, the conference will feature a unique panel presentation by beer bloggers, Ryan Newhouse (Montana Beer Finder) and Alan McCormick (Growler Fills), and Missoula Independent staff, Alex Sakariassen It's entitled, "How the Media and Bloggers Can Help Your Brewery," and it will take place on Monday at 3 PM. The brewfest will be judged by the Zootown Zymurgists, and the group is still needing volunteers for pouring, carding, wrist banding, beer wrangling, and token sales. Volunteers get free entry to the festival, a t-shirt and two free tokens. To volunteer, contact Asa Hohman at asahohman@gmail.com with your name, age, email, shirt size, phone number and preferred shift (11:30-4:00 or 3:30-8:00 PM).